Professor Motohara graduated from the University of Tokyo with a BS in Astronomy in 1995, and from Kyoto University with a PhD in Astrophysics in 2000. In 2000, he was a support astronomer for the Subaru Telescope. He became an Assistant Professor at the Institute of Astronomy in 2001, and started at his current position in 2010. One approach to studying the origin of the cosmos is the observation of celestial objects that were created immediately after the universe was born. The light emanating from such objects allows us to peer back into the past. However, in an expanding universe, objects in the distant past are very far from Earth, and the farther away they are the faster they are receding from us. This is a result of Hubble’s law, which states that the speed at which two points move away from each other is positively proportional to the distance between them. Therefore, the light from objects that are extremely far away and rapidly receding from Earth is strongly red-shifted due to the Doppler effect, and infrared observations at wavelengths longer than those of visible light become important. Places with dense dust and gas are also active areas for star formation. A better understanding of the process by which stars are formed is expected to provide clues to the origins of stars and galaxies. Their current project is the SWIMS infrared camera (upper right photo), intended for use in large telescopes. 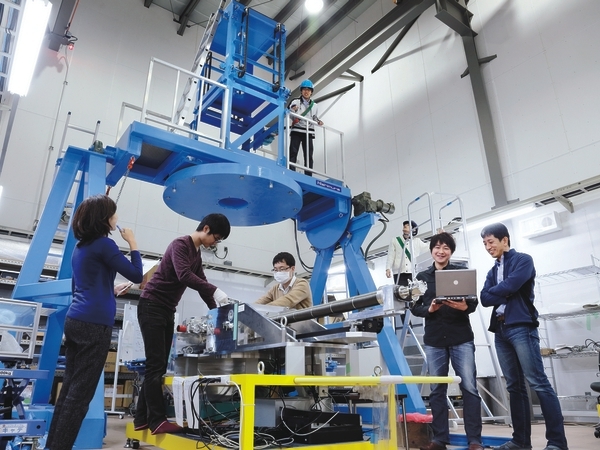 This will be the main camera for the 6.5 m telescope at the University of Tokyo Atacama Observatory (TAO) in the Atacama Desert in the mountains of Chile, scheduled to begin operating in 2017. In preparation, they are now verifying the camera’s performance by mounting it onto a simulator of the telescope (the pale blue stand at the bottom of the photo) and looking for ways to improve it. The TAO is located at an altitude of 5640 m above sea level, which is the highest astronomical observatory on Earth. That location was selected for a reason—water vapor in the atmosphere absorbs infrared radiation, an effect that is reduced at higher altitudes. Another deciding factor is that it is a desert region. 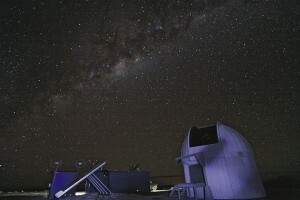 A small, 1-m telescope called miniTAO began operation there in 2009. It has an infrared camera called ANIR developed at the Motohara Laboratory, and it successfully captured images of hydrogen gas obscured by dust in the Galactic Center. Developing a new instrument takes years and is fraught with problems. Once that is complete, the next task is performing arduous observations in the wilderness. What sustains them through all their efforts is the thrill of being the first humans to see new things. “It’s hard work, but there’s nothing like the joy of seeing images taken by a camera we built,” Motohara says. This is how we create new eyes that allow us to see the cosmos. 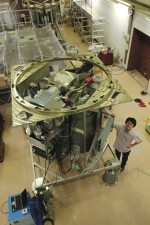 The SWIMS infrared camera, scheduled for installation on the TAO 6.5-m telescope. This is tested by installing it on the light blue simulator in the photo at the bottom of this page.The Galactic Center behind the miniTAO dome.